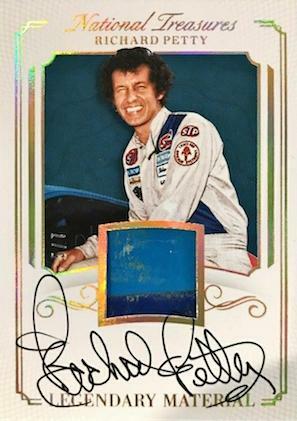 The sophomore NT effort for the sport, 2017 Panini National Treasures Racing NASCAR applies the excitement of a big race via the hit-filled product. Fans can look forward to eight hits that are broken down into two autographs, two autograph relics, three memorabilia cards, and a book card. After giving NASCAR collectors their first taste in 2016, the premium 2017 release is led by on-card signatures and race-used material. Although there is still a primary set, the 2017 Panini National Treasures Racing checklist switches gears by incorporating memorabilia in the base cards for the first time. Each showcasing hard-signed options, key inserts include the Legendary Material Signature cards that highlight the all-time greats, and Winning Material Signature cards for the most successful drivers on the track. Specifying the memorabilia are the Dual Firesuit Signature and Jumbo Tire Signature sets for notable subjects. And then we get to the booklets in 2017 Panini National Treasures NASCAR. Falling one per box, these also carry on the NT reputation but using a much bigger canvas. The Signature Six Way Swatches Book cards provide a sextet of relics with an on-card autograph, and the Dual Signature Material Book cards combine two drivers' signatures with a pair of memorabilia pieces. Limited to two copies, or just one, some of the rarest book cards feature impressive patches with a signature. This includes Associate Sponsor Signature, Flag Patch Signature, and Nameplate Patch Signature Booklets. 2017 National Treasures Racing DANICA PATRICK - DUAL RELIC AUTO BOOKLET! WOW! 2017 National Treasures Racing CARL EDWARDS - DUAL RELIC AUTO BOOKLET! NASCAR! 2017 National Treasures Racing KEVIN HARVICK + CLINT BOWYER AUTO RELIC BOOKLET! Danica Patrick 2017 Panini National Treasures Magnificent Marks Autograph 14 20! 2017 National Treasures NASCAR Matt Kenseth Jumbo Tire Signatures 07 10! 2017 National Treasures NASCAR Kasey Kahne Jumbo Tire Signatures 90 99! 2017 National Treasures HOLO GOLD JOEY LOGANO AUTO BOOK 6-Patches #d 6 10 RARE! 1 1 2017 National Treasures DAVE BLANEY AUTOGRAPH Printing Plate #d 1 1 WOW! CENTURY PARALLELS: Holo Silver #/20, Gold #/15, Holo Gold #/10, Green #/5, Black 1/1, Printing Plates 1/1. LAUNDRY TAG PARALLELS: Base Century 1/1, Legends Century 1/1 (*Tony Stewart only*). PARALLEL CARDS: Holo Silver #/20, Gold #/15, Holo Gold #/10, Green #/5, Black 1/1, Laundry Tags 1/1 (No LaJoie*), Printing Plates 1/1. PARALLEL CARDS: Holo Silver #/50 (Bodine, Burton - #/20*), Gold #/25 (Bodine, Burton - #/15*), Holo Gold #/15 (Bodine, Burton - #/10*), Green #/5, Black 1/1, Printing Plates 1/1. PARALLEL CARDS: Holo Silver #/25 or less, Gold #/20 or less, Holo Gold #/15 or less, Green #/5 (Keselowski - #/2), Black 1/1, Printing Plates 1/1. PARALLEL CARDS: Holo Silver #/20, Gold #/15, Holo Gold #/10, Green #/5 (Elliott - #/3*), Black 1/1, Laundry Tags 1/1 (No Jarrett*), Printing Plates 1/1. *Bill Elliott only in Black, Green, Printing Plates parallels. PARALLEL CARDS: Sponsor #/10 or less, Laundry Tags #/6 (Card #17 - #/3*), Gold #/6 or less, Holo Gold #/5, Holo Silver 1/1 (No Ryan Newman*), New Era 1/1 (No 17,18,19*), Printing Plates 1/1. All subjects not included in Printing Plates. View specific parallel numbering with the spreadsheet. PARALLEL CARDS: Laundry Tags #/6 or #/3, Holo Gold #/5, Sponsor #/5, Gold #/4, Holo Silver 1/1, New Era 1/1, Printing Plates 1/1 (No Yellow). PARALLEL CARDS: Gold #/25 or less (No Dale Jarrett*), Holo Gold #/15 or less, Green #/5 (Rusty Wallace - #/2*), Black 1/1, Printing Plates 1/1. PARALLEL CARDS: Holo Silver #/20 (Waltrip - #/19*), Gold #/15 (Petty - #/10), Holo Gold #/10 or less, Green #/5, Black 1/1, Laundry Tags 1/1 (Only Cope, Edwards*), Printing Plates 1/1 (No Waltrip Magenta*). PARALLEL CARDS: Holo Silver #/20 (No Dale Jarrett*), Gold #/15 (Jarrett - #/14*), Holo Gold #/10 (Knaus - #/7*), Green #/5, Black 1/1, Printing Plates 1/1. PARALLEL CARDS: Holo Silver #/20, Gold #/15, Holo Gold #/10, Printing Plates 1/1. 14 cards. Serial numbered #/5. PARALLEL CARDS: Holo Silver #/20, Black 1/1, Laundry Tags 1/1, Printing Plates 1/1. PARALLEL CARDS: Holo Silver #/20 (Earnhardt Jr only*), Gold #/15 (Earnhardt Jr only*), Holo Gold #/10 (Earnhardt Jr, Kahne only*), Green #/5 (No Busch*), Laundry Tags 1/1, Printing Plates 1/1. PARALLEL CARDS: Holo Silver #/20, Gold #/15, Holo Gold #/10, Green #/5, Black 1/1, Laundry Tags 1/1, Printing Plates 1/1. PARALLEL CARDS: Holo Silver #/20, Gold #/15, Holo Gold #/10, Green #/5, Black 1/1, Laundry Tags (No cards #4, #5*), Printing Plates 1/1. PARALLEL CARDS: Holo Silver #/20, Gold #/15, Holo Gold #/10, Green #/5, Black 1/1, Laundry Tags 1/1 (No cards #8, #10*), Printing Plates 1/1. All subjects not included in Gold, Holo Gold, Holo Silver parallels.View specific options with the spreadsheet. PARALLEL CARDS: Holo Silver #/20 (Labonte - #/18; No Mears, Custer, Kahne*), Gold #/15 (No Mears*), Holo Gold #/10 (Earnhardt Jr - #/8*), Green #/5, Black 1/1, Laundry Tags 1/1, Printing Plates 1/1. PARALLEL CARDS: Holo Silver #/50 or less, Gold #/25 or less (No Jarrett*), Holo Gold #/15 or less, Green #/5, Black 1/1, Printing Plates 1/1. All subjects not included in Holo Silver parallel. View specific options with the spreadsheet. PARALLEL CARDS: Holo Silver #/20. PARALLEL CARDS: Gold #/15, Holo Gold #/10, Green #/5 (Keselowski - #/2*), Black 1/1, Laundry Tags 1/1, Printing Plates 1/1. All subjects not included in Gold, Holo Silver, Tags parallels. View specific options with the spreadsheet. PARALLEL CARDS: Gold #/15, Holo Gold #/10, Green #/5, Black 1/1, Laundry Tags 1/1, Printing Plates 1/1. PARALLEL CARDS: Holo Silver #/20, Gold #/15, Holo Gold #/10 (Aric Almirola - #/9*), Green #/5, Black 1/1, Laundry Tags 1/1, Printing Plates 1/1. PARALLEL CARDS: Holo Silver #/20, Gold #/15, Holo Gold #/10 (Earndhardt Jr - #/8*), Green #/5, Black 1/1, Laundry Tags 1/1, Printing Plates 1/1. PARALLEL CARDS: Gold #/15, Holo Gold #/10, Green #/5, Black 1/1, Printing Plates 1/1. PARALLEL CARDS: Gold #/15, Holo Gold #/10 (Earnhardt - #/8*) Green #/5, Black 1/1, Printing Plates 1/1. PARALLEL CARDS: Holo Silver #/20, Gold #/15 (Petty - #/10*), Holo Gold #/10 (Petty - #/7*), Green #/5, Black 1/1, Printing Plates 1/1. PARALLEL CARDS: Holo Gold #/15 or #/10, Green #/5 (Brad Keselowski - #/2*), Black 1/1 (No Edwards*), Printing Plates 1/1. Bowyer not in Gold parallel. *View specific parallel numbering with the spreadsheet. Multiple Associate Sponsor versions exist for each card with up to 20 different options. Card Versions: Associate Sponsor (#1-20) 1/1. All subjects not included in each version. View specific options with the spreadsheet. PARALLEL CARDS: Goodyear #/2 or less, Car Manufacturer 1/1, Firesuit Manufacturer 1/1, Flag 1/1, NASCAR 1/1, Series Sponsor 1/1, Sunoco 1/1. PARALLEL CARDS: Holo Silver #/20, Gold #/15, Holo Gold #/10, Green #/5, Black 1/1. PARALLEL CARDS: Holo Silver #/20 (Johnson - #/15*), Gold #/15 (Johnson - #/10*), Holo Gold #/10 (Johnson - #/7*), Green #/5, Black 1/1, Laundry Tags 1/1. PARALLEL CARDS: Holo Silver #/20 (Cards #1, 3, 4, 5 - #/25*), Gold #/15, Holo Gold #/10 (Cards #9, 10 - #/7*), Green #/5, Black 1/1, Laundry Tags 1/1 (No cards #6, 8, 9*).